I would like to thank all those who attended the inaugural Hinchinbrook Agricultural Forum – Diversifying Our District. The Forum was well received with over 85 members of the public attending to hear from various presenters. The Forum was a great chance to hear about new developments and emerging trends in agriculture and to explore the opportunities on offer to seek a sustainable and engaging future to start attracting young people back to farming – back to our district. New and diverse industry is required to create jobs as a means of arresting population decline and retention of youth in our district. We know that we can grow most things in Hinchinbrook - soy beans, mung beans, sun hemp, sunflowers, canola, kenaf, taro, bananas, maize, corn and rice to name a few. The real hurdle lies with getting this produce to market and growing an industry. The Forum concentrated on avenues to overcome these hurdles. The following topics were covered at the Forum with attendees obtaining comprehensive knowledge of how we can move forward as a community and the positive steps already taking place in this sector. Presented by Mr Adam West, Regional Director – North, with the Queensland Department of Agriculture and Fisheries (DAF), this topic included an overview of Queensland’s Strategy toward development and implementation of policies and initiatives that encourage economic development in the agricultural industry. 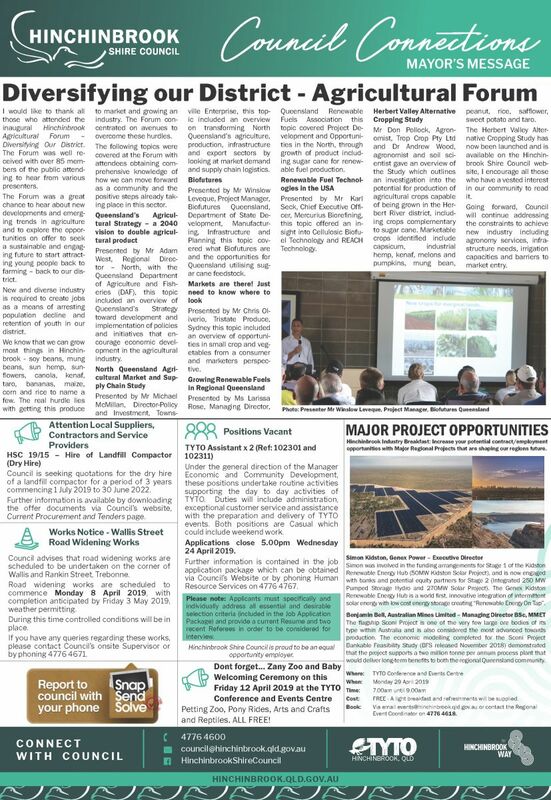 Presented by Mr Michael McMillan, Director-Policy and Investment, Townsville Enterprise, this topic included an overview on transforming North Queensland’s agriculture, production, infrastructure and export sectors by looking at market demand and supply chain logistics. 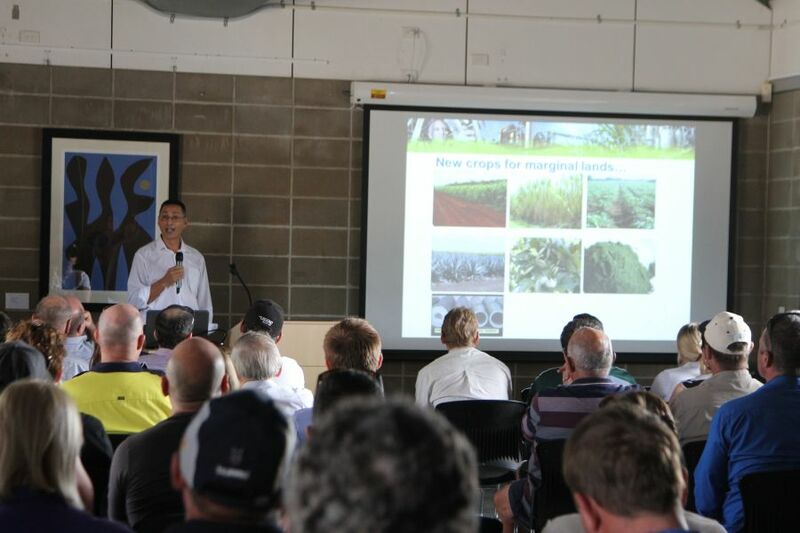 Presented by Mr Winslow Leveque, Project Manager, Biofutures Queensland, Department of State Development, Manufacturing, Infrastructure and Planning this topic covered what Biofutures are and the opportunities for Queensland utilising sugar cane feedstock. Presented by Mr Chris Oliverio, Tristate Produce, Sydney this topic included an overview of opportunities in small crop and vegetables from a consumer and marketers perspective. Presented by Ms Larissa Rose, Managing Director, Queensland Renewable Fuels Association this topic covered Project Development and Opportunities in the North, through growth of product including sugar cane for renewable fuel production. Renewable Fuel Technologies in the USA presented by Mr Karl Seck, Chief Executive Officer, Mercurius Biorefining, this topic offered an insight into Cellulosic Biofuel Technology and REACH Technology. Mr Don Pollock, Agronomist, Trop Crop Pty Ltd and Dr Andrew Wood, agronomist and soil scientist gave an overview of the Study which outlines an investigation into the potential for production of agricultural crops capable of being grown in the Herbert River district, including crops complementary to sugar cane. Marketable crops identified include capsicum, industrial hemp, kenaf, melons and pumpkins, mung bean, peanut, rice, safflower, sweet potato and taro. The Herbert Valley Alternative Cropping Study has now been launched and is available on the Hinchinbrook Shire Council website, I encourage all those who have a vested interest in our community to read it. Going forward, Council will continue addressing the constraints to achieve new industry including agronomy services, infrastructure needs, irrigation capacities and barriers to market entry.